Travelers to Florida and some Caribbean islands are advised to postpone their trips until the destination is ready for visitors. Irma was at one point the most powerful recorded storm in the open Atlantic and its hit on the tourism industry will be significant, although an exact figure is still unclear. 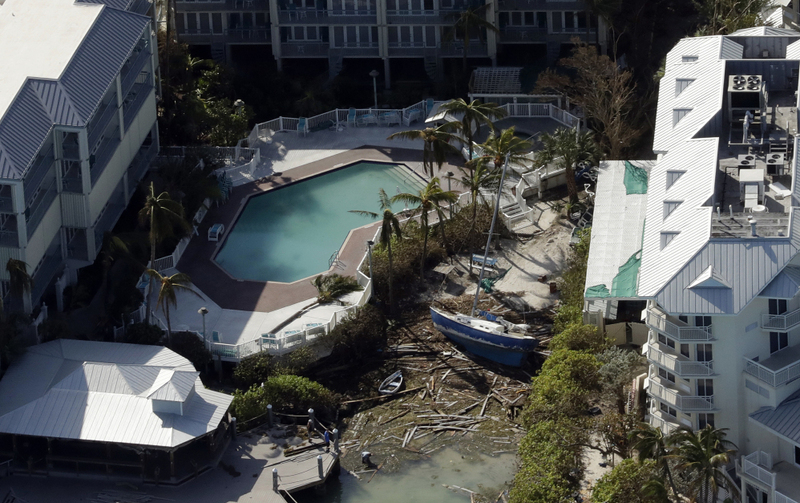 AIR Worldwide estimates that Irma’s damage to insured property in the U.S. will range between $20 billion and $40 billion, with damage in the Caribbean between $5 billion and $15 billion. Other estimates go higher, and that only accounts for damage covered by private insurance. Universal Orlando Resort reported “relatively minor damage” to fences, trees, signs and facades as its theme parks reopened Tuesday. Its popular Halloween Horror Nights event will go on as scheduled Friday. Disney’s water parks won’t open till later this week but most other attractions are running. The Dali Museum’s massive geodesic glass bubble, known as the Glass Enigma, “is fine,” but its “Wish Tree,” where visitors tie wishes written on their admission wristbands, was felled in the storm. Museum spokeswoman Kathy Greif said the museum hopes to restore the tree. 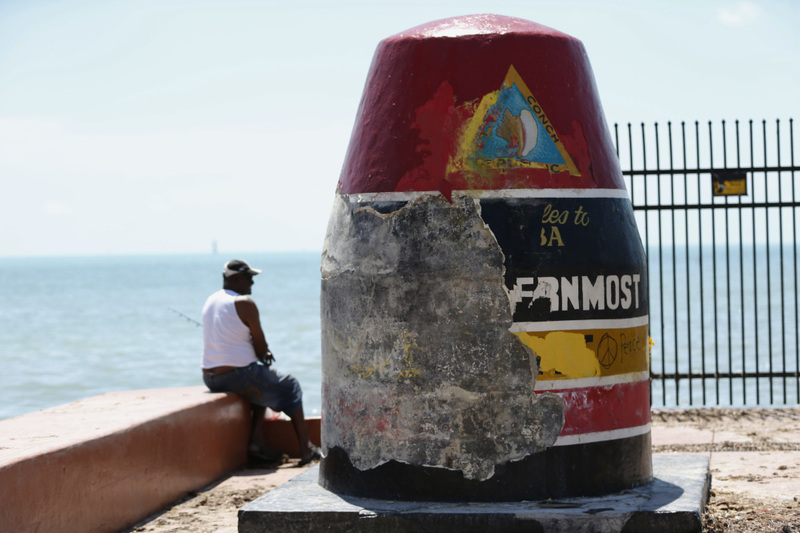 A man fishes Wednesday next to the “Southernmost Point” buoy, damaged by Hurricane Irma, in Key West, Fla.
Florida Keys tourism spokesman Andy Newman said travelers should postpone trips there until “the destination is ready to receive visitors.” He said Key West’s famous “90 Miles to Cuba” marker is solid concrete and “ain’t going nowhere” but cleanup and restoring utilities, communications and other services will take time. Impact in the Caribbean varied. Widespread damage was reported in the British Virgin Islands, Barbuda, St. Martin and St. Barts, including its famed Eden Rock Hotel. In the U.S. Virgin Islands, St. Croix was said by the Caribbean Tourism Organization to be “getting back to business,” but visitors were encouraged to avoid St. Thomas and St. John. Turks and Caicos had just a couple of open hotels, with others closed anywhere from one week to two months. But the Dominican Republic fared OK, and many hotels in Puerto Rico and the Bahamas – including the popular Atlantis, Paradise Island – reported being back to normal. Many cruise ships that homeport in Florida or were on Caribbean itineraries when Irma developed were kept at sea, had sailings canceled or made unscheduled port calls, in some cases stranding or delaying passengers. Royal Caribbean’s Oasis of the Seas, for example, was kept at sea to avoid the storm, delaying passengers from returning as scheduled and postponing its next sailing. Caroline Makepeace and her family were on Carnival Vista when it became clear the ship would not return to Miami as scheduled. “We had a choice to get off the ship in Cozumel, Mexico, and make our own way home,” she said. They flew home to Raleigh, North Carolina via a flight from Cancun. Caribbean itineraries, which she said account for 50 percent of cruise business, will be drastically altered. Norwegian Escape, for example, has shifted ports of call for the foreseeable future from the Eastern Caribbean – including the U.S. and British Virgin Islands – to the western Caribbean, which includes ports in Mexico. Mike Driscoll, editor of the industry publication Cruise Week, said he expected many cruisers will “put off booking a Caribbean cruise near-term” because the overall message vacationers heard “was that the Caribbean was devastated.” The cruise industry typically sees bookings increase for the new year beginning in November, but Driscoll said he believed many cruisers would hold off until after Jan. 1 to see how things shake out. Florida ports were “not measurably damaged,” Spencer Brown said, but the reopening of PortMiami was delayed Wednesday, with several media outlets reporting sunken sailboats amid debris that needed to be cleared before cruise ships could dock. According to Frank Comito, CEO of the Caribbean Hotel and Tourism Association, less than 20 percent of the region’s total hotel room inventory has been affected by Irma and the time needed to rebound varies tremendously by destination.